Film-concert in the Kermlin Palace of Congresses for the participants of the meeting dedicated to the 60th Anniversary of the Great October socialist revolution. Concert dedicated to the 60 anniversary of October in the Kremlin Palace of Congresses in Moscow. Present: Leonid Brezhnev, Mikhail Suslov. B. Lanovoy reading poetry. Images from the feature film: a volley of Aurora, the storming of the Winter. E. Kindinov reading poetry. Chronicle. "The first horse. Cavalry gallops. Images from the feature film "Chapaev. Chronicle. The First Five-Year Plan. Train rides. Great Patriotic War. Flies Nazi aircraft. Bombs fall. Collapsing house. Woman weeps. Are the Soviet soldiers. Crossing. M. Ulyanov reading poetry. T. Syniavska sings "In the front-line forest". Chronicle. The soldiers smoke, read, write letters. E. Belyaev sings "In the dugout." Chronicle. A rest soldiers. The fighting Soviet troops. Artillery strikes on the Reichstag, hoisting the flag. Supports E. Nesterenko. Chronicle. The development of virgin land. Leonid Brezhnev on the virgin lands. The construction of BAM. Work: steel makers, weavers, farmers. Oil. Take-off missiles. Speakers: Mokrenko, Z. Khanlarova, R. Turaev, E. Obraztsova, M. Kolontarova, M. Bieshu, ensembles: "Birch", Ukrainian SSR, Lithuanian SSR, Azerbaijan SSR, Estonian SSR, children's ensembles and others. Gala concert dedicated to the 60th anniversary of the October Revolution. The building of the Kremlin Palace of Congresses - CU. In the hall stood applauding CDS present. In the entry hall and sit in the first row of L. Brezhnev and other members of the Central Committee of the CPSU. LI Brezhnev greets members of the party and the government, shakes hands with UV Andropov - LS. The stage reciting poetry actor Vasily Lanovoy (synchronous) - CU. Assault "Winter" volley "Aurora» - LS., MS. 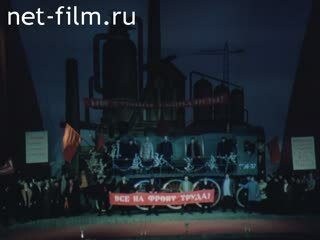 Actors listen to the voice of the stage VI Lenin, shouting "Hurrah!» - LS., MS., PNRM. Poetry reading actor E. Kindinov (synchronous) - CU. Galloping horse, the banner of "The First Cavalry» - LS., MS., CU. Excerpts from the movie "Chapaev". On stage - vocal and choreographic compositions: attack with a cart - different. "First Five" songs: "Our locomotive forward fly ..." scene "Industry of the country," "Turbine" - different., PNRM. - All simultaneously. Reads an excerpt from the poem "Vasily Terkin" People's Artist of the USSR Mikhail Ulyanov (synchronously) - MS., CU. Nazi flying aircraft dropped bombs, explosions, collapsing houses, the hand turns roulette bomb explodes factory chimneys. By the burning village is a fascist, a woman crying, hugs her Soviet soldier - MS.
Go Soviet soldiers rolled cannon are wounded on a stretcher, a cart sits wounded soldiers, Soviet soldiers at the crossing - PNRM., Various. On stage singing folk artist of the RSFSR T. Sinyavskaya (synchronous) - LS., MS., CU. On stage, the ensemble performs "Songs and Dances" Alexandrov. People's Artist of USSR E. Belyaev sings the song "In the dugout" (synchronous) - LS., CU., PNRM. Dramatization of the Victory Parade in Red Square: German soldiers are carrying banners and throw them on stage - LS., MS., CU., PNRM. Soldiers watch photos of their relatives - CU. Soldiers read and write letters - CU. Shoots "Katyusha» - LS., MS.
Go Soviet tanks - LS. Soviet gun shoots, the inscription "For the Reichstag." Soviet soldiers with a banner run to the Reichstag. The Reichstag salute volleys of rifle Soviet soldiers - MS. Victory Day Parade on Red Square May 9, 1945 - LS., MS., CU., PNRM. Monument "Motherland» - LS., CU. Framing plans: there is a train, steelworker, pouring steel, throw rocks in the river, the car "KAMAZ", cotton spinner at the bench, weaver, loaded tractor, spilling grain, tractor on the field - different. Rocket takes off - MS.
Yuri Gagarin on the phone - CU. The people welcomed Gagarin - MS., CU. PNRM. on the oil reservoir - LS. The girl runs to her mother - MS., PNRM. In the hall of the Kremlin Palace of Congresses of the special session serves LI Brezhnev - CU. On stage singing USSR People's Artist Yevgeny Nesterenko with the choir - LS., MS., CU. Demonstrators carry a portrait of LI Brezhnev and posters - MS.
LI Brezhnev and his party in Helsinki - MS.
Workers at the factory rally - MS. Demonstration on Red Square - CU. With flowers are participants of the concert from different republics - different. On stage decoration Spassky Tower, leaving the dancers celebratory dance tune. Ensemble "Birch" and soloists song and dance of the autonomous republics of the RSFSR perform the dance "Festive Overture» - LS., MS., CU. Performed different dances (synchronous) - Various. Sings the national artist of the USSR A. Mokrenko (synchronous) - LS., MS., CU. Ukrainian dance ensemble, "Rejoice, O earth!" Vocal and dance suite (synchronous) - Various. Children's violin ensemble music schools in the city of Alma-Ata perform a dance from the opera "Biryasan and Sara" M. Tumbaeva - PNRM., Various. Folk Song and Dance Ensemble "Lietuva" Lithuanian SSR performs suite "In the rhythm of work", the feet in wooden shoes - CU. 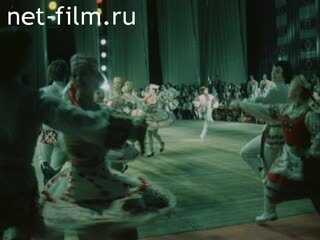 Dancing group of the Latvian SSR - different., PNRM. Sings Folk Artist of Azerbaijan SSR Z. Khanlarova (synchronous), the girls are dancing - LS., MS., CU. Suite on Estonian folk games and dances. Performs folk dance "Sõprus" (synchronous) - PNRM., Various. "Virtuoso folk tune" O. Ogombaeva ensemble performs komuzistov Kyrgyz State Philharmonic (synchronous) - LS., MS., CU., PNRM. 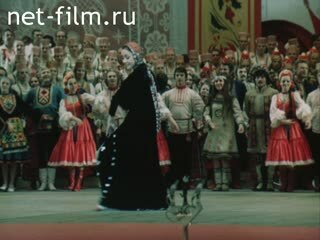 Vocal and choreographic composition "My color edge" performed by the State Folk Choir of the Byelorussian SSR, the group Dulcimer Belarusian State Philharmonic, artists BSSR State Dance Ensemble, folk dance group "same age" of the Palace of Culture of the Belarusian Trade Union Council - different., PNRM. Song of the Turkmen carpet singer performs the Turkmen State Opera and Ballet Theatre named after Makhtumkuli, Honored Artist of the Turkmen SSR R. Puraeva and women's group honored folk dance ensemble of the Turkmen State Philharmonic M. Tagmuda (synchronous) - Various. Youth Dance Ensemble of the Armenian SSR performs "Holiday Dance" - different., PNRM. Vocal and dance suite "Tanovar" implement the State honored folk dance of the Uzbek SSR "Ziff" - different., PNRM. Dance "at the celebration of fishermen" to music by R. Pauls implement the State Dance Ensemble of the Latvian SSR "Daile" brass band "Riga" - different., PNRM. Ballet song "At the rink" performed by soloists of the Bolshoi Theater, Honored Artists of the RSFSR Semenyaka L. and A. Godunov - different. Rachmaninov Romance on poems Tyutchev "Spring water" People's Artist of the USSR performs E. Obraztsova (synchronous) - Various. Dance of "Joy" A. Alaeva performing folk artist M. Kolontarova Tajik SSR and Honored Artist of the Tajik SSR E. Asanova - PNRM., Various. Men accompany doira - CU. Georgian Dance Ensemble "proud" of the Palace of Pioneers in Tbilisi perform highland dance - PNRM., Various. Singing soloist of the State Opera and Ballet Theatre of the Moldavian SSR M. Bieshu "Homeland, on your birthday" poems Bode (synchronous) - MS., CU. Acts of State Folk Dance Ensemble of the Moldavian SSR "Joc" (synchronous) - Various. On the scene for all the participants of the concert - LS., MS.
Hall stands, applauding - MS. Applaud the members of the government, applauded concert participants and attendees - LS., MS. The curtain closes - LS., MS.